One of only 12 exquisite cottages to be build on a freshwater peninsula within Haig Point's newest neighborhood, The Sanctuary. The home enjoys water views with a main living level extending across an open floor plan. Features 2,498 SF of living space accented with fine architectural details. Entertain at the gazebo and on the big roomy porches. Asking $739.000. Relax or entertain with ease in this stunning ranch-style home located within at The Georgia Club, Stratham, GA. Special features include fire pit, 4 BRS/ 3.5BAs, in-law apartment, eat-in gourmet kitchen, fireplace and seasonal golf views. Asking $899,000. This new-construction home with chef's kitchen is set within the golf and lake community of Lake Arrowhead, GA. Offering 3 BRs/2.5BAs, it is directly on the water and is dockable. While sitting on the rear deck and patio, you will see inspiring views of the lake and mountainside. Asking $749,900. 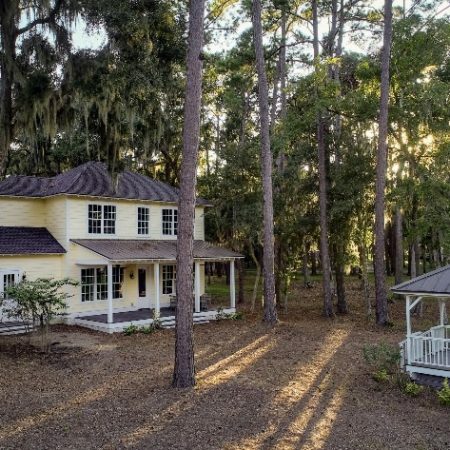 Enjoy panoramic marsh vistas on Callawassie Island from this charming coastal home. Even better, you'll be treated to views of Callawassie Island Club's Tom Fazio-designed golf course. Leave your car at home and walk the short distance to the clubhouse, tennis and fitness. Asking $449,000. The Landings on Skidaway Island, GA, is the setting for this expansive custom residence. It features an open floor plan and fine lagoon views from every room. It’s located in the family-friendly Plantation neighborhood on a quiet cul-de-sac. Asking $699,900. This maintenance-free home is set on the 12th fairway of the GlenLakes championship golf course. Luxury features includes a new Jacuzzi, gas fireplace and swimming pool. Designed and built with great attention to detail and craftsmanship, it offers a generous 2,492 sf of living space.Asking $324,900. This wonderfully maintained home at 6800 Sparrow Hawk Drive occupies a quarter-acre end lot with serene grassland views on two sides. It was built in 2015 and is move-in ready. Asking $499,900.